Barry Flanagan was born in Prestatyn, North Wales. He studied architecture at Birmingham College of Art and Crafts and after spells at different colleges was accepted on the Vocational Diploma in Sculpture at St. Martin’s School of Art in London in 1964. Flanagan graduated in 1966 and taught at St. Martin’s School of Art and the Central School of Arts and Crafts, between 1967 and 1971. In 1991 was elected to the Royal Academy and he received the OBE. From the outset Flanagan’s work has been perceived as radical and independent. He revolutionised sculptural material when in 1965 he showed the soft sculpture ‘aaing j gni aa’, 1965 at Better Books, Charing Cross Road (bought by the Tate Gallery in 1969) works such as this and ‘4 casb 2 ’67’, 1967 changed ideas about the language of sculpture forever. Flanagan was interested in ‘pataphysics, Alfred Jarry’s ‘science of imaginary solutions’ and this ethos is evident in the playfulness of his approach, which allows materials to find their own sculptural form, whether sand, or rope, stone, sheet metal, cloth, clay or bronze. He was included in the show, ‘Between Poetry and Painting’ at the ICA also in 1965 when he contributed a finger poem. His first solo exhibition was held at the Rowan Gallery, London in 1966. Thereafter he exhibited in numerous solo and group exhibitions, in Britain and abroad, including the seminal ‘When Attitudes Became Form’, Bern, ‘Op Losse Schroeven’, Amsterdam both in 1969 and ‘Information’ New York in 1970. His first solo exhibition at Waddington Galleries, London was held in 1980. Flanagan is perhaps best known for his dynamic, often monumental, bronze hares, which spring into life and were first exhibited in the early eighties. Flanagan fuses the everyday, the imaginary and fantastical to mould clay into animal forms, hares, elephants, dogs and horses – the horse is an archetype of classical sculpture. When asked about the use of the hare motif Barry would describe the magical experience of seeing a hare running on the Sussex Downs. This event prompted the first Leaping Hare sculpture in 1979. For the Egyptians the hare represented life. In Chinese mythology the hare is the sole inhabitant of the moon and the symbol of immortality. This mercurial image of the hare has come to stand as surrogate for human existence and our relations to the animal world. His return to bronze with the hare, he had cast work in the foundry at Central School with Henry Abercrombie in 1969, was part of his exploration into different media, from the sand, rope and felt pieces, which focused on composition and challenged previous ideas of what sculpture might constitute, to the ceramics, stone, marble and sheet metal sculptures of the seventies. Many of his works have humorous titles for example ‘A Nose in Repose’ 1977/78, collection Tate. He was involved in happenings and dematerialised practices and collaborated with Yoko Ono in 1966 and later in 1980 with the Marjorie Strider dance company. Like his contemporaries from St. Martins, Richard Long and Bruce McLean, Flanagan experimented with film. He was included in ‘Land Art’, Gerry Schum’s Video Gallery exhibition with the film, ‘A hole in the Sea’ 1969. The exhibition ‘The horses of San Marco’ at the Royal Academy of Arts, London, in 1979 made a deep impression on Flanagan. Henry Abercrombie described the exhibition’s impact on Flanagan’s thinking and approach to sculpture, where the sheer tactile physicality of the ancient modeled horses created an aura and majesty. It was the ancientness of the sculptures that demonstrated man’s relation with the animal as much as the desire and means to represent it. The varied patinas and gilding also provided substantial material to investigate the properties of bronze and the catalogue included essays on ancient casting methods, gilding in the Greek and Roman eras and an investigation of the foundry techniques used to cast the horses of San Marco as well as analyses of the best ways to preserve the horses. The bronze sculptures of horses each have a distinctly different character for instance the beautiful majestic and powerful ‘Horse’, 1983 at Jesus College, Cambridge to the gentle diffidence of ‘Field Day’, 1986, also known as the ‘Korus Horse’ in San Eulalia, Ibiza and the mysterious, mythological qualities of the ‘Unicorn and Oak Tree’, 1991. Flanagan represented Britain at the Venice Biennale in 1982. A major retrospective of his work was held at the Fundacion ‘La Caixa’ Madrid in 1993, touring to the Musée des Beaux-Arts, Nantes in 1994. 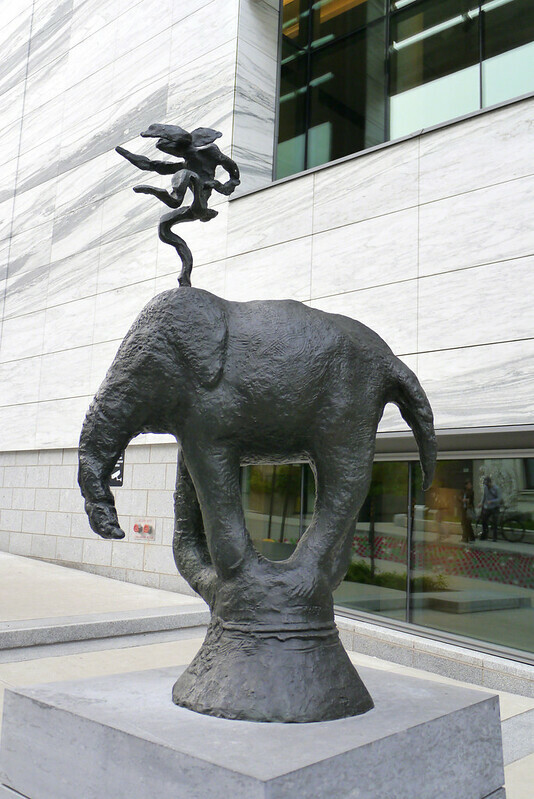 Flanagan’s bronze hares have also been exhibited in many outdoor spaces, most notably on Park Avenue in New York in 1995-6 and at Grant Park, Chicago in 1996. In 1999, he had a solo exhibition at Galerie Xavier Hufkens in Brussels followed by an exhibition at Tate, Liverpool (2000). In 2002, a major exhibition of his work was shown at the Kunsthalle Recklinghausen, Germany, and toured to the Musee d’Art Moderne et d’Art Contemporain, Nice. In 2006, the Irish Museum of Modern Art in Dublin held a major retrospective of his work, in association with Dublin City Art Gallery The Hugh Lane, which included ten large-scale bronzes installed along O’Connell Street and in Parnell Square. His work is held in public collections worldwide including the MOMA in New York, Tokyo Metropolitan Art Museum, Centre Georges Pompidou in Paris and Tate in London. In 2011 Tate presented Barry Flanagan Early Works 1965 – 1982. Image published by art_inthecity on 2013-07-26 23:15:44 and used under Creative Commons license.